Tyrannosaurus Mouse: When do you use large-diaphragm vs small-diaphragm mics? When do you use large-diaphragm vs small-diaphragm mics? 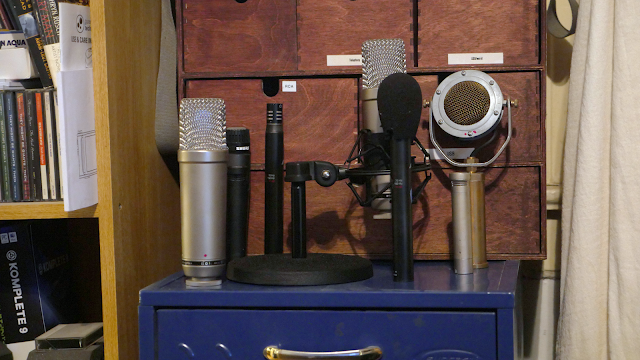 When do you use large-diaphragm mics? When do you use small ones? Choirs and distant-miked voices? Small diaphragm. A very weird and specific (albeit reasonably-priced) collection of microphones. Snare drums are inevitably small-diaphragm if you're gonna mic them (which everybody does but for me it doesn't work that great), but overheads become a matter of taste between whatever large or small diaphragm mics you have. Acoustic guitars -- man, I don't know. I can go either way. Electric guitar amps -- typically the close mic is small, but a mic 3' to 25' away? That one will typically be a large (if you use a distant mic on your guitar amp which I typically do not). Large diaphragm mics are more sonically colored. Small diaphragm are more accurate. Voices get too strident on small diaphragm mics. Are these rules? No, they're just my general prejudices and opinions. There what I intuit when I go to mic things. And it troubles me that I don't have any more a firm grasp on the why and wherefores of using a particular microphone type on a particular instrument. But that's all I got.